Flavor infused chocolate. Wherever you look, there they are. Bars consisting of chocolate combined with added flavors, from fruits to spices, from nibs to salt. The world of fine chocolate is enormous diverse as it is, packed with chocolate bars that take your senses from one flavor tone to the other. But combine this brown gold with flavor additions and the possibilities become endless. Chocolate Naive, situated in Lithuania, is currently setting up a whole new range of bars to satisfy the taste of its customers. Thay graciously provided me with samples of the full range, so you can expect their products to pop up on this site from time to time. 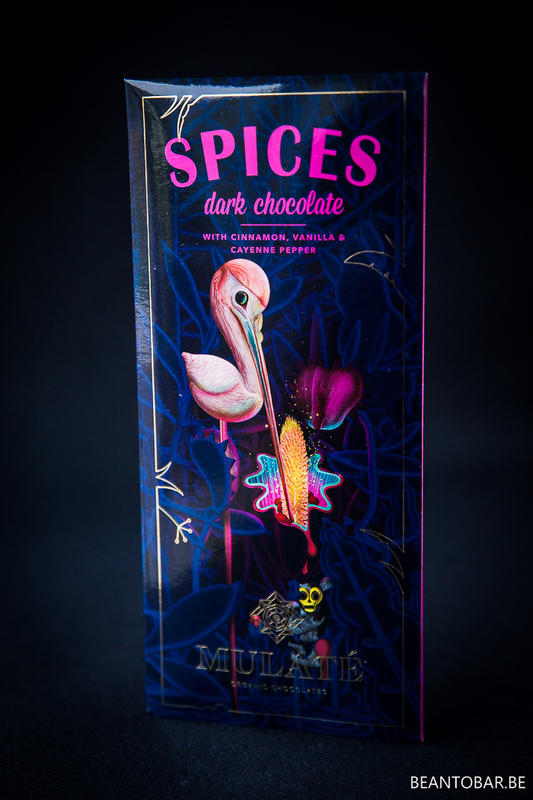 Today we look at a bar released under the name Mutalé Organic Chocolates. Breaking away from their stylish origin chocolates and award winning and very tasty bars like “Dark Chocolate with Forest Honey”, Mutalé aims for far more exotic taste experiences. The Spices Line has a Dark Chocolate with Cinnamon, Vanilla & Cayenne Pepper that sounds promising, so we discover the new range by trying this bar. The package strikes me as extremely exotic. Non of the stylish designs Naive carries. A lush, slightly psychedelic artwork is shown on the glossy cardboard box f the bar. Vibrant pink and gold imprint made me think of India in a flash. The pink fairy tale bird, drinking from an exotic flower against an dark blue background gives it a dreamy night atmosphere, while a little monkey with skull like face adds a bit of danger to the mix. By far the most intriguing sleeve I’ve seen in a long time! When you open it up, a silver foil hides a big looking 80 g bar. The bar itself is made out of big squares with an uneven relief, making it as eccentric as the sleeve. Little info is found on the origin of the cacao used in this bar, other than the mysterious text in the sleeve: “Between the tropics of Capricorn and Cancer the shores of a small mysterious island are swashed by the warm waves of sea. Sleepy palms are rusting with hot tropical breeze with bright-coloured creatures hiding under their leaves. Only the bravest dare enter by walking the sand, wading the jungle, climbing the mountains and passing the streams. Finding a treasure is to find pods. The chocolate is infused with 1% cinnamon, 1% vanilla and 1% cayenne pepper all from organic origin. Let’s find out what these small amounts of infusions mean to the final flavor. Color: A lighter shade of brown, nearing dark milk chocolate. Aroma: Sweet, smoky wood, cinnamon, yet still a distinct cacao aroma. 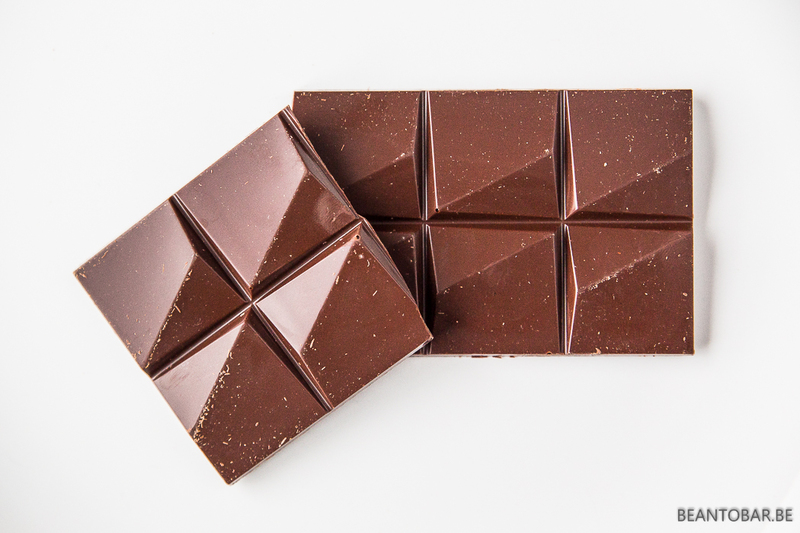 Taste: The bar has a softer snap than regular dark chocolate. The taste opens pretty sweet, as to be expected from a sub 70% bar. Immediately strong vanilla and cinnamon explode in the mouth and a sharp tingling in the back of the mouth reveals the presence of cayenne pepper. The cacao flavor is able to punches through the strong aromas and reveals a somewhat fruity and roasted flavor for a moment, before warm and sweet cinnamon returns near the end of the melt. The overall flavor reminds me of an Asian spiced gingerbread or speculoos. The texture is a bit softer than most dark chocolate, due to the presence of clarified butter.As a result, the molten chocolate feels a bit thicker in the mouth, a bit more greasy without being too clingy. All in all this is pretty different chocolate compared to the dark bars I’m used to by now. The added pepper adds a great twist to the sweeter, aromatic taste. 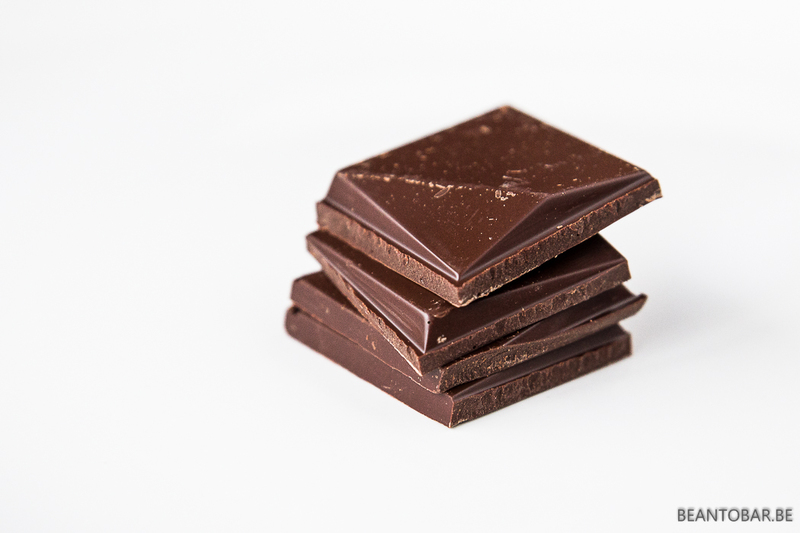 The chocolate eats easily away, and has lots of flavor to offer, yet it takes the focus away from the pure chocolate flavors of non infused bars. Luckily the knowledge of a Naive shows through. The aftertaste lingers on for ages and you still get a nice cacao flavor amidst all the spice tones. I consider this a novelty bar that can be enjoyed as a change from enjoying origin chocolate, a chocolate that opens up new possibilities in taste experiences. However, personally I still prefer my chocolate pure.